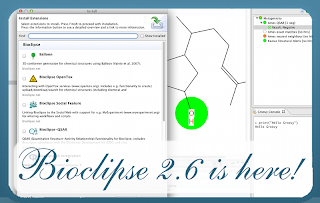 The Bioclipse team is proud to announce the release of Bioclipse version 2.6. 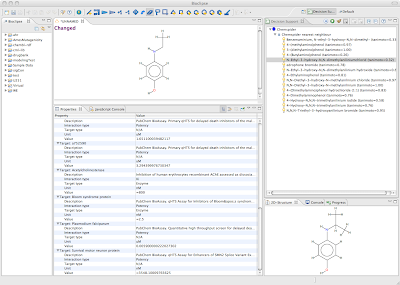 The release contains new Decision Support models (such as for ChEMBL and Chemspider), the latest CDK with e.g. improved aromaticity detection, and Bioclipse-R (including R-models for DS), improved core stability based on Eclipse 3.8 and support for Java 1.7, new installation processes for Windows and Mac OS X, and numerous bug fixes. 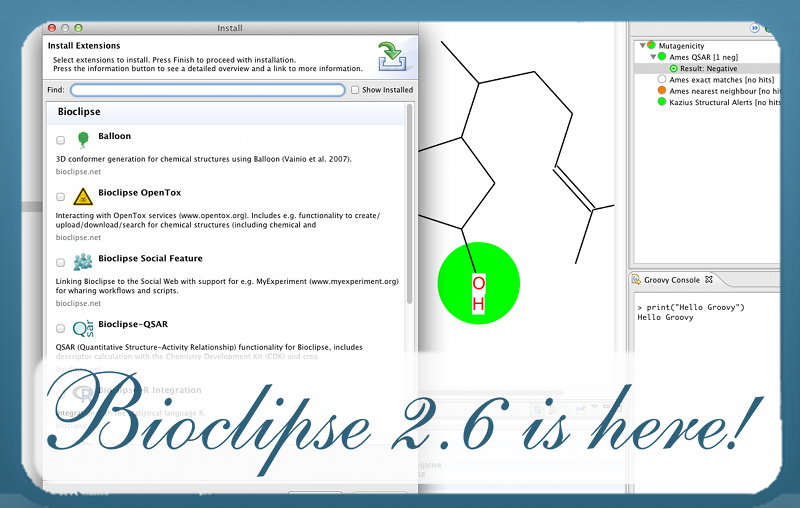 Bioclipse 2.6 is available for Mac OS X, Linux, and Windows and can be downloaded from Sourceforge. A getting started guide is also available. Thanks to everyone who has contributed to this version. Bioclipse Decision Support is a system where users can draw or import chemical structures, execute multiple predictions or database lookups, and visually interpret results. This was previously demonstrated for chemical liability assessment, and for running OpenTox predictions. Query ChemSpider using the SimilaritySearch via the Web API (SOAP). For a maximum of 15 nearest neighbors in Chemspider, query ChEMBL-RDF for interactions, and present information about assays, targets, and interaction values. Below you can find a screenshot of how it looks like in action. Now, the ChemSpider similarity search is rather slow (>30 s) but then again it takes a while to query 27 M chemical structures. Note: This work was done against a development version of Chemspider Web API. You also need a security token in order to be able to query Chemspider; it's free and can be obtained here. When you have a security token, paste it into the Chemspider section of the Bioclipse preferences. The Chemspider + ChEMBL model for Bioclipse Decision Support will be part of the 2.6 release of Bioclipse, which we hope to have in place within a few weeks. Thanks to Egon Willighagen (ChEMBL-RDF) and Valery Tkachenko (Chemspider) for aiding me in this work. We have an open postdoc position in the group of Pharmaceutical Bioinformatics at the Department of Pharmaceutical Biosciences, Uppsala University, Sweden. The successful applicant will conduct research on data interoperability for predictive toxicology, and especially design and implement an infrastructure consisting of a database and user interfaces for data and predictive models in toxicology. Of particular interest will be to merge chemical and biological data within a semantic framework, and link toxicity data to genomics and metabolomics data (toxicogenomics) with a connection to the Bioclipse framework (www.bioclipse.net). PhD degree or equivalent scholarly competence in a relevant branch of chem/bioinformatics or computer science and a strong interest in informatics and data integration is required. Required competences include web programming, databases, and working knowledge in Java. Experience with linked data is desirable. Deadline for application: May 9th , 2012.